I met Dave and Julz at a networking event. When I heard Dave had gone through a massive transformation to get to where he is now, I knew I wanted to hear the full story. Dave is incredibly open and honest about his story and while he did all the talking, it was easy to tell Julz is the support that holds him up. 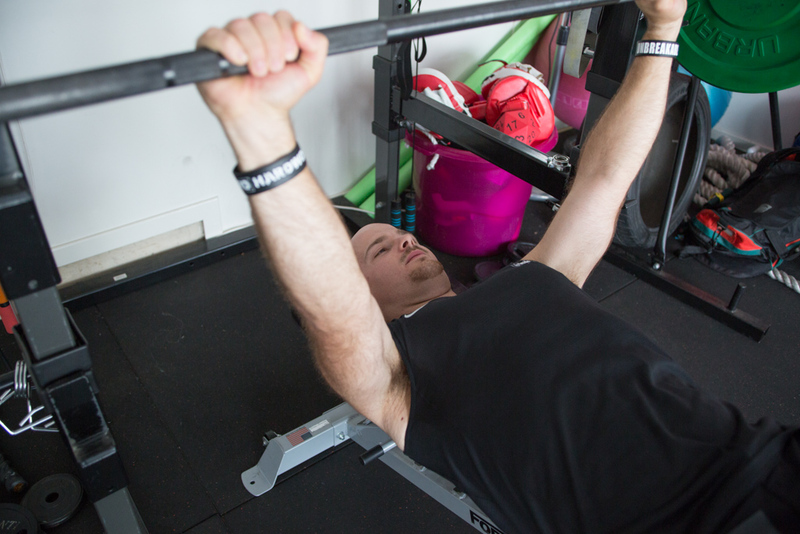 Dave and Julz run HWPO fitness – Hard Work Pays Off, for those of you who are wondering what it stands for. They couldn’t have picked a better name as Dave is living proof of how hard work really does pay off. A year ago I aligned myself with a health and wellness company Isagenix. I do a lot of speaking at their wellness meetings and one night I was doing a presentation and Julz was in the crowd. I didn’t really see her that much and then I think I got a message from her, no a friend request (on Facebook). It was 10pm that night and I think it was about 3 or 4 am that we were still talking – we found out that we were both musicians, we were both into health and fitness and Julz was studying exercise. So here’s me, I’m a drummer and Julz is a singer songwriter. I found out she likes Wests Tigers, so we are both Wests Tigers supporters, she’s also into Isogenic and I thought ‘that’s it’, so I asked her, “Are you spoken for?” That was 10 months ago. 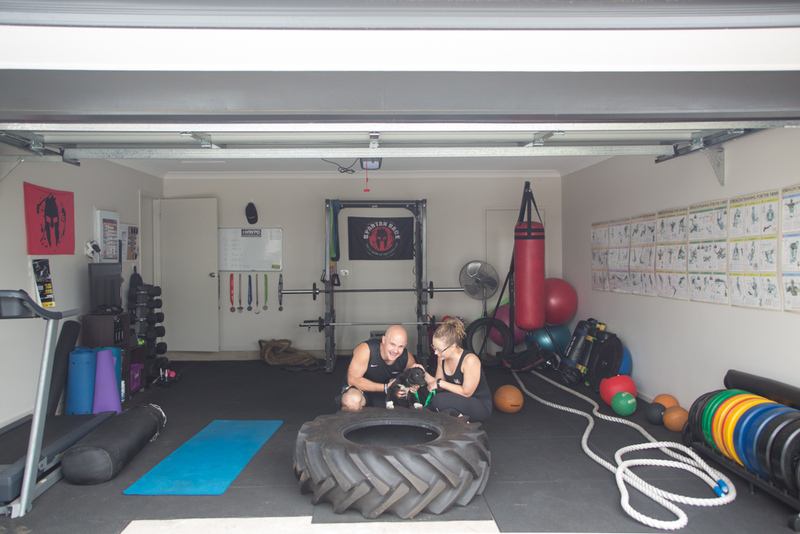 In that time we got our place, we have a family (little Rowdy, the dog), we’ve gone into partnership in the business HWPO Fitness and we’re building our Isagenix business together. It’s all just happened so quick. I’ve been on a journey of health most of my life, but more so in the last ten years. I was diagnosed with Perthes disease when I was 9 years old. Perthes disorder is in the hip, where there is no blood flow between the socket and the ball, so it just ate away at my hip. I had nine operations and the last one was a major hip re-construction, which was around the age of twelve. We were told that worse case scenario was I would probably be in a wheelchair by the time I was 22 because it was such a severe case. I was always a big, stocky boy growing up but I played football and t-ball and I managed to keep the weight in check. As soon as this came along (the operation) though, I was on my back for about a year and had to learn how to walk again. I kept eating the same foods and there was no exercise, so I just blew up and in high school I was at my heaviest. Through year 11 and 12 I was 155kg and that was the biggest that I ever remember seeing on the scales. I had to put up with a lot of crap through high school – I never really got teased because I always pretended to be the happy, fat, jolly kid, who just made friends with all the kids and had no beef with anyone so as not to get picked on. Deep down inside though it was constantly going through my head, 24/7, things like body image and trying to talk to girls. Everyone was always fitter or stronger and I never imagined that I would ever have anything to do with health or fitness in my life. There comes a point where you just accept what you’ve got and think that’s as good as you will ever be. After school, I started to just do a little bit of swimming, more for rehabilitation of my hip than anything else. I found that it was really good because there was no pressure on my hip or joints and I started to lose weight, bit by bit. I ended up losing 30-40kgs between 2008-2012. People then started commenting -because when you are that big you could lose two kilos and look great, so I just made a little game of it. I thought, every time I lose five kilos, that will be the last time that I ever see that number on the scale again and I just chipped away at it. I didn’t think about the end goal, I didn’t even see myself in my ideal body, I just thought I have to get to the next number on the scales. That was all working out really well but I was in a toxic relationship and I was in the same workplace for seven years. There was only so much I could do health and fitness wise with the emotional stress that I just couldn’t get passed. Everything just came to a grinding halt. That’s where I realised that environment is stronger than willpower and that’s something I live by now. I tell everyone else that you can be eating organic, exercising four hours a day, meditating, doing all that, but if you are still stressed about bills or your partner or kids or work then nothing is going to change; everything needs to be in check; everything needs to be flowing. When I realised all of this, I left the toxic relationship of four and a half years, changed jobs, Mum sold her house at Riverstone and we moved to the lovely Jordie Shore as I call it. (Jordan Springs) That’s where we are now. All that happened around 2012 and as soon as it happened, within a month or two, I was shifting a kilo to a kilo and a half a week – just like that. Mind you, I was single for the first time in four and a half years, so as you can imagine I was out partying, I was drinking heavily, I was still losing weight, which was crazy because I wasn’t trying at all, but it was just the emotional stress that had lifted off my body and my body just started to thank me. Everything was running smoothly, but then the issue came up about my drinking habits and alcohol. That was really the last thing that I had to shift in order to complete my transformation. The last time, the last really bad incident that I can recall, was that I was meant to go to a family member’s house for an announcement but it was also a guy from work’s birthday. The work people were going to the Colonial and I said to Mum that I’d just be there for an hour. I think I got home at about 2am. Mum tried to talk to me, I said ‘get stuffed’ and woke up three or four hours later to drive to work. Mum tried to stop me but I pushed her away and told her not to tell me what to do. I just remember going to work that day and all I could think about was that my sisters were probably talking about me, saying I shouldn’t be drinking – it’s all I could think about all day and what I was going to cop when I got home. We then had the conversations when I got home and that’s when I made a decision that it had to be all or nothing. I used to say to the family that I am not going to drink at home and I would only drink at my mate’s place so they didn’t have to worry about me. Little did I know that they were more worried because I wasn’t there and about what was going to happen if I decided to drive or do something stupid. People saw see me as this bloke who had lost all the weight and worked really hard to get there, but deep down inside I was a fraud. I wasn’t changed in the way I wanted, so I made the choice that it was nothing at all. I couldn’t have two beers and leave it at that because two beers turned into eight, that turned into shots, that turned into lights out. As of a couple of weeks ago I have been sober a year and that’s when I found Isagenix. Isagenix made me delve deeper into health and what I was eating. I got into obstacle racing, so that upped my training as well. It seems like ever since I made that choice to let the drinking go and focus on my health and trying to help other people, that the universe has just gotten behind me. I’ve been introduced to this community who want nothing but to be around the same, like-minded, happy, healthy people. I have met the love of my life in Julz and I guess my whole mission of what I am trying to tell people these days is that it is achievable. I give myself the title of transformation coach and I think I have earned the title. It has taken me ten years of struggle, figuring out the dos and don’ts and how everything works. It is very hard to sit someone down and say, ‘Right, if you want to change your life you are going to have to get eight hours sleep, drink four litres of water a day, try and eat this and that, try and do this’. For most people it is very unrealistic, so you need to address it one thing at a time and find out what the worst thing is. You can tell when someone comes to do a session with me and all they talk about is their crap day at work that that is the thing they have to fix. Now they’re coming to training to do 45min of high intensity exercise, already stressed, and now stressing their body even more! People join a gym and they slam themselves an hour a day, 4-5 times a week, thinking they are going to lose the flab on their tummy. These people though are coming from a job that they hate – they’ve just worked a ten hour day and they have to go home to a partner they don’t trust or kids that are driving them up the wall. We have to get to the stage where we get real. We have to, with love. Always with love. We have to get honest and tell it how it is. Otherwise, we just keep going around in circles and we don’t address the big elephant that’s sitting right in front of us. As soon as that goes, everything changes, but we have to get there first, get to the problem first. It is different for everyone – they might love their job, they might love their partner, but they have a drinking problem, they might have anxiety or major stress issues. We are all big boys and girls and need to put the big boys pants on and accept the situation that you are in. 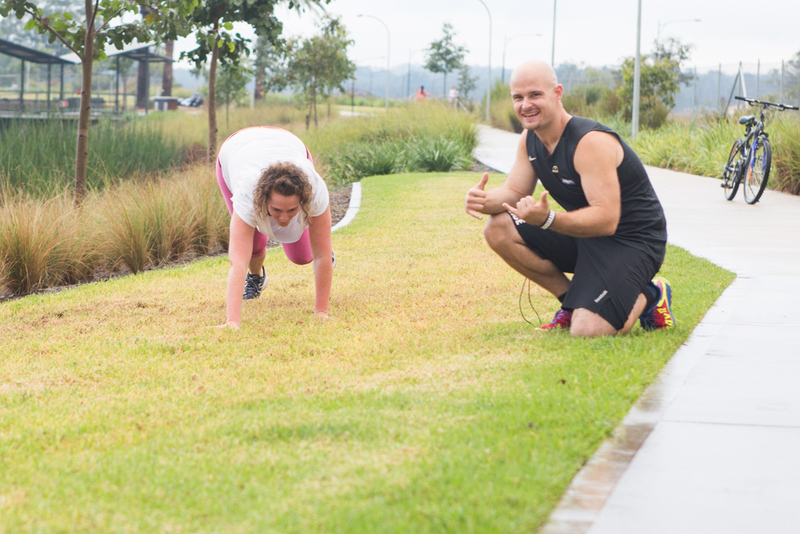 After spending time listening to Dave’s story I was inspired to join Dave and Julz for their free boot camp they run every Tuesday night in Jordan Springs. Anyone is welcome to join find more info here. Thanks to Connor who took this photo!